The uStepper Robot Arm, which is based on the industrial palletizer robot was introduced during our Kickstarter campaign in 2015. Two iterations later we had the uStepper Robot Arm currently available on our shop and our GitHub. For the uStepper Robot Arms 3 years anniversary we now present the 4th and latest iteration! 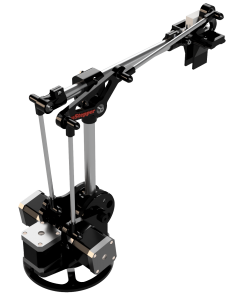 The uStepper Robot Arm has the advantage of being scalable by adjusting rod lengths and thereby making the range of motion scalable! We just love Robots! So we designed a Delta Robot using the same electrical setup as the uStepper Robot Arm! 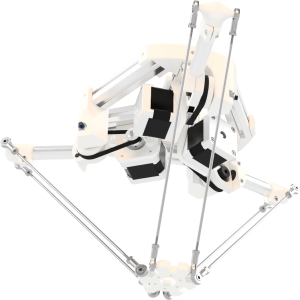 The uStepper Delta is designed with the mindset that it must consist of a limited number of parts and be simple to assemble! The uStepper Delta has the advantage of being blazing fast at moving light objects within a limited work area. Like the uStepper Robot Arm the uStepper Delta is designed to be scalable by changing rod and aluminum bar lengths.